Scary, vertiginous, awe-inspiring - pick your adjective. Skellig Michael is all these things and more. And if you can find the courage and lung-power to get to the top If one couldn't be closer to God here, then I don't know where one could! 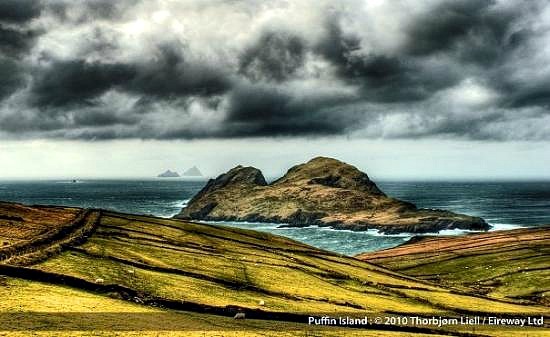 The Skellig Islands “Na Scealaga” in Irish, once known as the Skellocks which means a steep rock, are two small, steep, and rocky islands lying about 13 km out in the wild Atlantic west of Bolus Head and Valentia Island on the Iveragh Peninsula. From any angle, or from any vantage point on the nearby Ring of Kerry, they are spectacular pinnacles, which have magnetised viewers for generations. The smaller island is Little Skellig which is closed to the public, and holds Ireland's largest and the world's second-largest northern gannet colony, with almost 30,000 pairs. 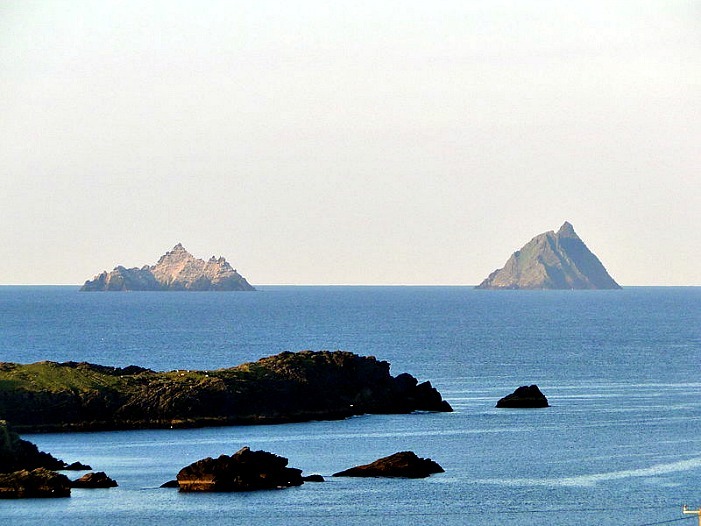 It is about 1.5 km east-northeast of Great Skellig. Skellig Michael is the larger of the two islands, with two peaks rising to over 230 m above sea level. With a sixth-century Christian monastery perched at 160 m above sea level on a ledge close to the top of the lower peak, Great Skellig is designated as a UNESCO World Heritage Site. The first reference to the Skelligs occurs in legend when it is given as the burial place of Ir, son of Milesius, who was drowned during the landing of the Milesians. A text from the eighth or ninth century refers to an episode of strife between the Kings of West Munster and the Kings of Cashel. Duagh, King of West Munster is said to have ‘fled to Scellecc’. This event is attributed to the fifth century but we have no means of knowing if a settlement existed on the island at that time. The earliest reference in history to the Skellig Islands dates back to 600AD. During the time of the Penal Laws, Skellig Michael and Little Skellig became a haven for many Catholics whose beliefs and rights were being suppressed. Skellig Michael was home to one of the earliest monastic settlements in Ireland. The monastery on the top may have been founded as early as the sixth century, reputedly by Saint Fionán, but the first definite reference to monks on the Skelligs dates to the eighth century when the death of ‘Suibhni of Scelig’ is recorded. Skellig is referred to in the annals of the ninth and tenth centuries and its dedication to Saint Michael the Archangel appears to have happened some time before 1044 when the death of ‘Aedh of Scelic-Mhichíl’ is recorded. It is probable that this dedication to Saint Michael was celebrated by the building of Saint Michael’s church in the monastery. The church of Saint Michael was mentioned by Giraldus Cambrensis in the late twelfth century. His account of the miraculous supply of communal wine for daily Mass in St. Michael’s Church implies that the monastery was in constant occupation at that time. The Monks on the island led simple lives and lived in stone, beehive shaped huts alongside oratories, a cemetery, stone crosses, holy wells and the Church of St Michael. These isolated archaeological remains show the dramatically spartan conditions in which this early Christian community lived. They would descend the 670 steps early every morning and fish for the morning’s breakfast and would spend the rest of the day praying in the church, tending to their gardens and studying. The huts, which are round on the outside and rectangular on the inside, were carefully built so that no drop of rain ever entered between the stones. Do you know who you are? Does your great, great grandfather come from near The Skelligs? The monks used a system of retaining walls to construct level terraces upon which they constructed their buildings within the inner enclosure. The lower terracing within the outer enclosure provided garden areas for cultivation. As there is no fresh water supply on Skellig Michael, the monks devised a sophisticated method of water collection to serve their needs. Two water cisterns were constructed within the inner enclosure of the monastery and a third a little to the west. These were designed to collect water from the exposed sloping bedrock above the monastery. The cisterns were constructed before the cells within the monastery, indicating the importance of water management for the survival of the community. A series of cells form the north side of the inner enclosure. Cell A which faces the Large Oratory, was the communal cell and it had an upper level in the interior. The cells date from more than one period and reflect the development of dry stone construction during the early medieval period. Cell F is a typical dwelling cell. They focus on the Large Oratory, the most important building in the working monastery. The area around the oratory is paved and there is a special area of quartz paving to the front. Associated with the oratory are leachta and the Monks’ Graveyard. An additional terrace was added in order to construct the Small Oratory. Alongside this is the monastic latrine which is a small beehive structure constructed over a steep ravine. Over a hundred stone crosses of varying sizes have been recorded on the island. The two largest are highly decorated and are located to the north and south of the Large Oratory. The cross on the north is set into the leacht which pre-dates the oratory. These crosses and associated leachta are early features of the monastery. In the thirteenth century a general climatic deterioration resulted in colder weather and increased storms. 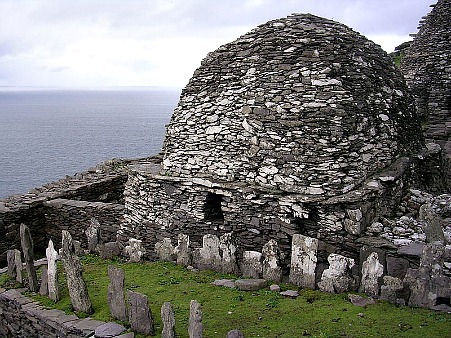 This, together with enduring several Viking raids, changes in the structure of the Irish Church, signalled the end of the eremitical community on Skellig Michael. The monks appeared to have moved to Ballinskelligs on the mainland at about this time. The Prior of the Augustinian Abbey at Ballinskelligs was referred to as the Prior de Rupe Michaelis in the early fourteenth century, implying that the island still formed an important part of their monastery at that time. The monks eventually left the island in the thirteenth century and it subsequently became a place of pilgrimage. Both of the Skellig islands are well known for their seabird colonies. There is a fantastic wealth of birdlife on and around the Skelligs, and together comprise one of the most important seabird sites in Ireland, both for the population size and for the species diversity. Among the breeding birds are European storm-petrels, northern gannets, fulmars, Manx shearwaters, black-legged kittiwakes, common guillemots, razorbills and the famous Atlantic puffins (with 4,000 or more puffins on Great Skellig alone). Smaller numbers of choughs and peregrine falcons can also be seen. The surrounding waters teem with life also. Grey seals are common, and basking sharks, minke whales, dolphins, beaked whale, and leatherback turtles have also been recorded. The islands have many interesting diving sites due to the clear water, an abundance of life, and underwater cliffs down to 60 meters (200 feet). The monks constructed three sets of steps to their monastery, affording access during differing weather conditions. These are known as the East, South and North Steps. Only the South Steps are accessible by the public today. The three flights of steps start as rock-cut steps and are then constructed of dry-stone once they are out of reach of rough seas. The South and North Steps meet at Christ’s Saddle, the only reasonably flat part of the island, and continue as one as far as the monastery. A short section of the original South Steps was removed to create the lighthouse road in the 1820s. It is from this road that the visitors begin their ascent and the first couple of flights are not original. The steps are very dramatic as they wind their way up the island affording great views back to the mainland and Little Skellig. There is a long flight, which leads up to Christ’s Saddle where the visitors can rest before continuing up to the Monastery itself. At the top of the access steps there is a nineteenth century entrance, which leads into the Upper Monks’ Garden. The original entrance can be seen at the other end of this garden, located at the top of the East Steps. Are you going to take the trip and experience the Skelligs yourself? Not for the feint hearted but worth every ounce of effort. This is an attraction on a par with the Pyramids in its ability to inspire awe and wonder in visitors. A spiritual and moving experience awaits those who ascend to the summit and it is not a scary as it seems (although we went on a dry day!). The vision that inspired the monks and the hardship endured by them is a real education especially for the iPad teenage generation. Do yourself a favour and just go! The boat journey from Portmagee takes 50 minutes, your approach to the island from Portmagee presents you with a magnificent view of the monks’ steep route which rises above Blind Man’s Cove and climbs perpendicularly, up towards their monastic settlement strategically placed, to avoid, the cold North winds, on the 217m high Southern Pinnacle. From the boat you have a bird’s eye view of the neighbouring Little Skellig (Skellig Beag) bird sanctuary and the Kerry coastline. The ferry takes you for a twirl around the bird sanctuary. Skellig Beag is lauded for the unique myriad of flora and fauna that inhabit its slopes providing, among other things, a home for the world’s second largest colony of Gannet. You disembark from your ferry boat and follow the more gentle path that winds circuitously around the side of the island. a route that was blasted out by the Lighthouse men in the 19th century. This path climbs less perilously than the monks’ track but it skirts sheer cliffs and requires protection overhead from the possibility of falling rocks. It is not hard to imagine the validity of the records of the lighthouse keepers which tell of the many fatalities, deaths caused by falls over these treacherous cliffs. You must be cautious and not to stray off course. Accidents now are minor and rescue by helicopter a facility not afforded to earlier pilgrims. You reach Christ’s Saddle, a flatter expanse where the early monks cultivated their vegetables. And now ready yourself for the final 600 step ascent to the monastic settlement itself. Along the way you will see puffins emerging from rabbit-like burrows that litters the route. The approach to the monastery from Christ's Saddle leads to a long narrow terrace. A doorway in the rear wall gives access via a flight of Steps to a larger enclosure, which is in its turn terraced and subdivided; the lowest level contains the main monastic enclosure, comprised of a church, oratories, cells, a souterrain, and many crosses and cross-slabs. The white quartz paving between the buildings gives the ensemble an urban quality. Your first sighting of the settlement is the eastern window of the medieval church that still stands. Through its frame you will get a picturesque view of Little Skellig, the bird sanctuary. As distinct from the other buildings in the settlement imported stone from nearby Valentia Island was used here for this construction. The Large Oratory has the usual inverted boat-shaped form, with a door in the west wall. It is built from coursed stone, rectangular at the base and becoming oval as it rises in height; the elongated dome terminates inside in a row of large slabs. The Small Oratory is more carefully constructed, and is considered to be later in date. Nearby are the unique remains of a beehive-shaped toilet cell. Cell A is the largest of the six cells and must have had a communal function. Several have cupboards and projecting stones for hanging purposes. They vary in plan - square, rectangular, and D-shaped; several retain their original flagged floors. St Michael's Church is rectangular in form, unlike the oratories, and would originally have had a timber roof. Two stages of construction can be identified: a small church in mortared stone was later expanded, using much larger sandstone blocks. In the centre of the church is a graveyard belonging to the Lighthouse families of 1868, the monks’ graveyard lies beyond the window frame. Beehive huts comprising a kitchen, two oratories and sleeping cells cluster around the central passageway. A look inside one of these demands that you stoop low, feel a drop in temperature and readjust your vision to the dark interior. In the corners you may detect a slight movement. But you will have been warned by your guide not to disturb what may be a nesting gannet. At this moment you could be overwhelmed by emotion, several people do when they reach the settlement. They cry silent tears of relief and appreciation. Everyone speaks in hushed tones and move respectfully through this ancient site that was, and still is, a place of worship. Here the monks came to be as close to God as possible eking out their existence on this hard, relentless outcrop of sandstone in a high and remote settlement where nature sets the rhythm. They modelled themselves on the desert fathers of early Christian times who spent their days in meditation. But these monks must have been skilful craftsman and men of self reliance to have created this amazing stone settlement and to have survived. You can relax now and tuck into your sandwiches, (You did bring them), then it is back down the steps to the boat and back to Portmagee. You will have accomplished an attempt that countless other pilgrims before you have attempted down through the ages. You will find your-self in the splendid harbour town of Portmagee. You can head for The Moorings where you can enjoy the best fish in town, any number of ancient and astonishing places to visit in the vicinity, pubs to gather in and stories to hear. Although the expedition to the Skelligs is not for the faint-hearted, the trip to is a manageable excursion for most. Skelling Michael will still be there, unchanged, and waiting, and if by luck you do happen to make it out to Skellig Michael some day you will never look at the world the same way.